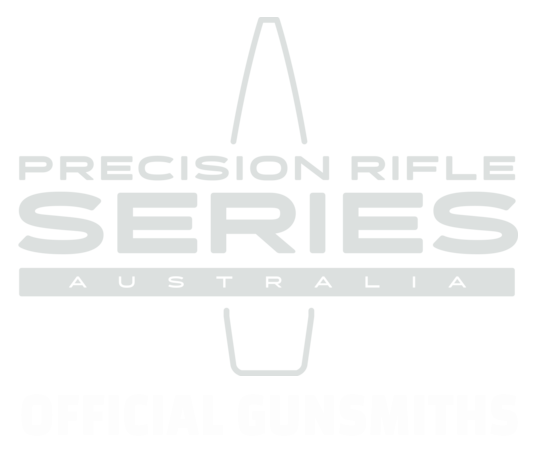 This is the end product after meeting a customer who wanted a custom IPSC (International Practical Shooting Competition) race gun, for competing in open major class. The handgun is a Tanfoglio XL4 in 38 super. We were given free run on design with a few minor specifications from the customer. 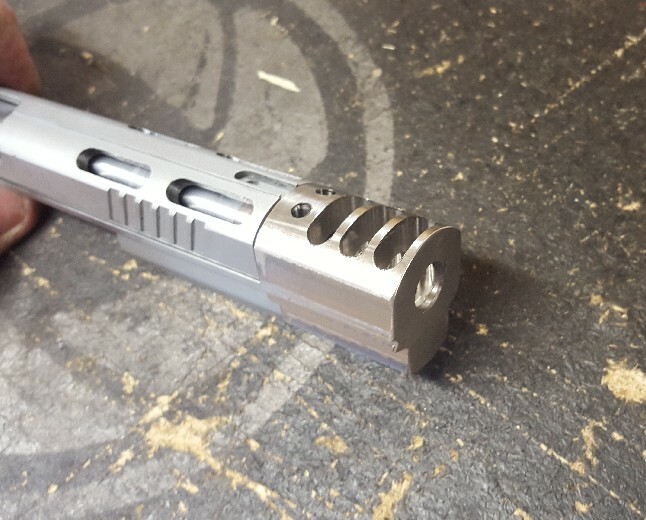 The custom compensator started as solid steel. 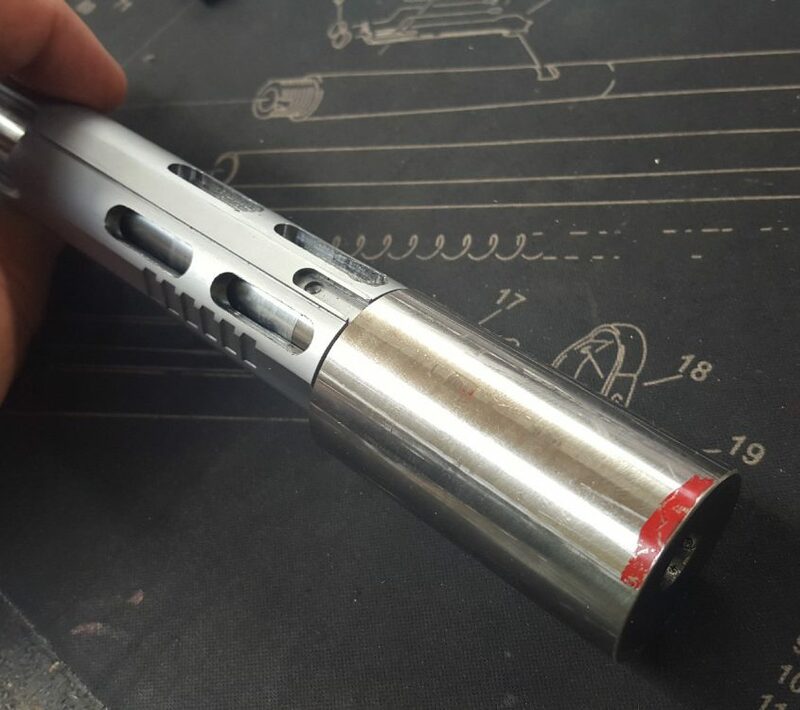 A custom compensator in early machining stages. 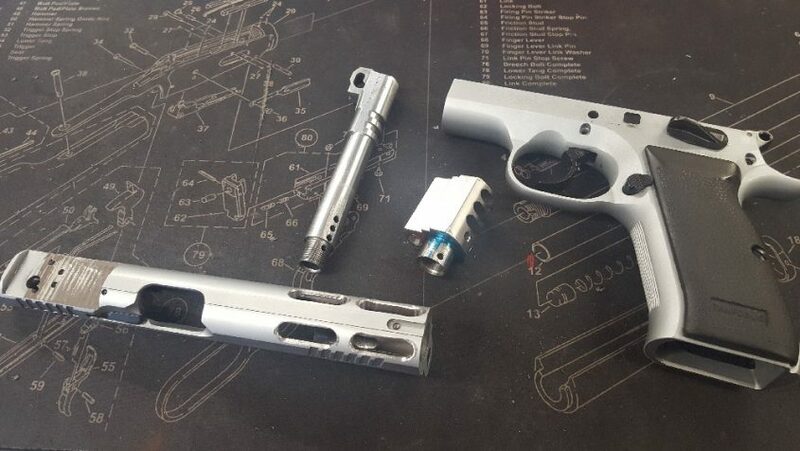 After machining: this compensator was designed and manufactured by Ignition Custom Engineering to transform a Tanfoglio XL4in 38 super into a custom IPSC handgun. 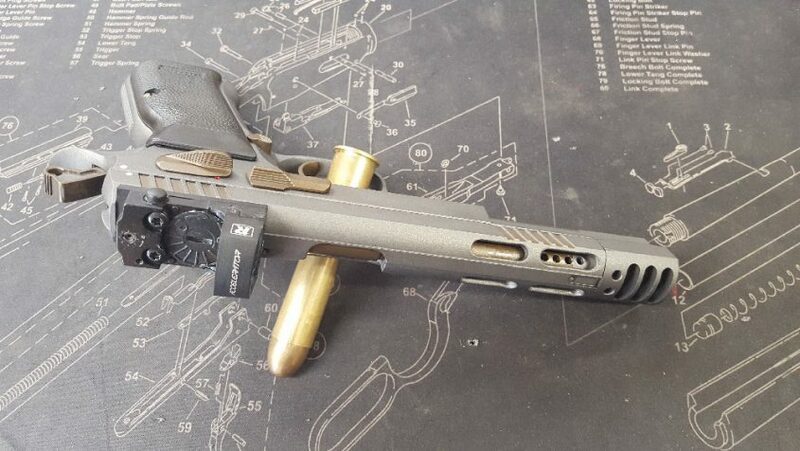 All the machine work is complete and the newly customised Tanfoglio XL4 is ready for the Cerakote process. 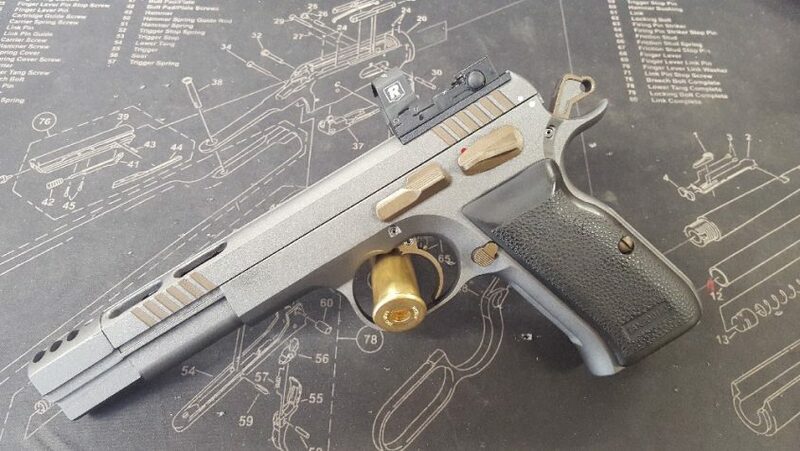 A top view outlining the compensator design on a custom Tanfoglio XL4in 38 super reworked into a custom IPSC handgun with worked hammer, trigger, custom ICE compensator and Cerakote. If you look closely through the barrel port, you can see the barrel un Burnt Bronze and lubricant (its freshly oiled ready for use). This Tanfoglio XL4in 38 super was reworked into a custom IPSC handgun with worked hammer, trigger, custom ICE compensator and Cerakote. First we cut in a red dot sight to aid rapid target acquisition. 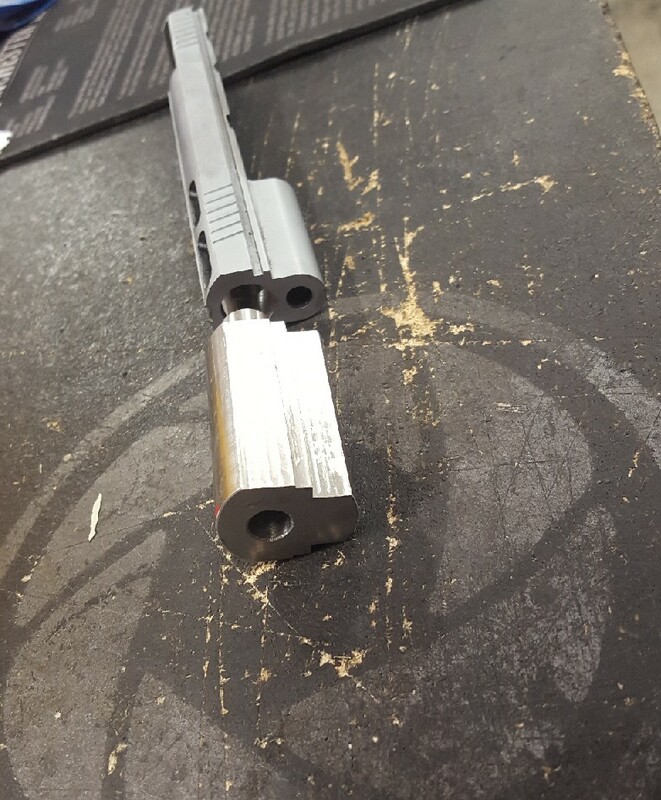 Next came a new custom compensator, designed by Ignition Custom Engineering and fabricated in-house from scratch. This will reduce recoil, allowing the shooter to stay on target longer and decrease time between aimed shots. We lightened the hammer for decreased lock time. It was also partially skeletonised to reduce weight and reduce strike time. Then we only had to perform a minor trigger job to get it to standard. The Tanfog was finished with custom duo-tone Cerakote work to stand out in competition. Colours used were Tungsten and Burnt Bronze (with 10% black).